A bus crash in Ecuador's Andes mountains left 11 people dead, authorities said Saturday, bringing the country's death toll from such accidents to 46 in the past three weeks. 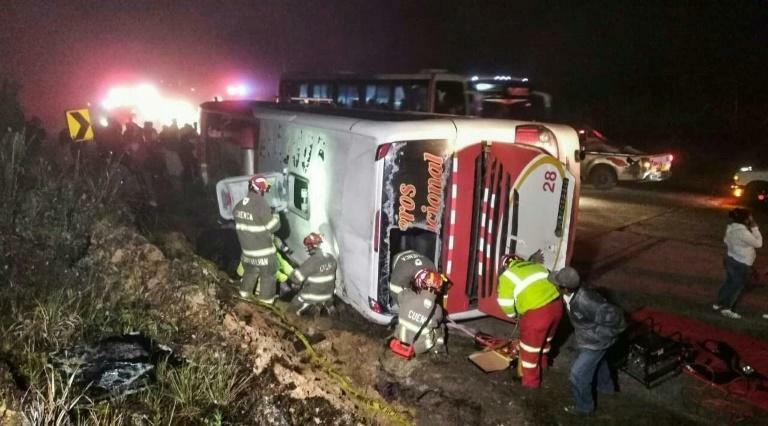 The bus was traveling toward Loja, in southern Ecuador, when it crashed 21 kilometers (13 miles) south of the city of Cuenca. "There are a total of 37 injured and 11 dead reported in this morning's accident," the health ministry's regional office said on Twitter. Images posted on Twitter by the Cuenca fire department showed the bus overturned on its side. On August 14, a Colombian bus carrying 40 passengers crashed on the outskirts of Ecuador's capital Quito, killing 23 people, among them Colombians and Venezuelans. Days earlier, another bus carrying Barcelona football fans crashed in southern Ecuador, killing 12 people and injuring 30.